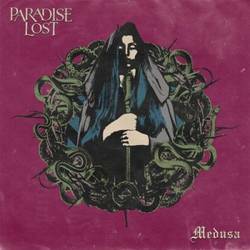 With the daring first notes of a church organ, Paradise Lost primes its listeners for a quasi-sermon on the mount in Medusa. A part description of suffering, part omen for eventual destruction, part heroic call to arms in the face of meaninglessness, Medusa glorifies godless bravery and turns those who cower from responsibility to stone. The album is predicated on humanities continual fall from grace through both failed gods, and human dishonesty. Salvation is undercut by a weighty judgment given sonic birth by the resonant pop, smack and stick of the drums, a buzz saw guitar-bass combo—I think the classic HM-2 pedal is used here—down tuned for heaviness sake, and a surprisingly well enunciate black metal crow, peppered with strong clean vocal crooning reminiscent of Dave Gahan from Depeche Mode. Within the failure of god implies a power vacuum and the eventual return of the Ancient god’s brutality, the gods of revenge, harsh judgment, and flames. Medusa addresses this problem first with eschatological doom, psychologically and spiritually enumerating inherent suffering. In the title track, the lyrics reach full pathos and describe the paralyzing effect of dishonesty amongst life surrounded by tragedy, begging for bravery. The album proper closes with three songs describing the sociological consequences exacerbating unnecessary suffering and death with the realization that chaos of gods penetrates all levels of being, psychologically, spiritually, and sociologically. The collapse of one means the collapse of all. By far the albums most unique song is "Blood & Chaos". With a catchy chorus and a stick out lead riff, the song is easily their most radio friendly. Also its fast tempo makes it an interesting outlier, improving the albums diversity, and adding a well needed anthem to a very downbeat album. Ideally aggressive music gives voice to frustration and angst to fit genre conformities. Some of Medusa’s lyrics seem stretched and overblown, with concepts extended over multiple songs when they could be focused into one or two. Unfortunately the lyrics make me doubt the singer knew the definitions of the words he chose. Slight formatting issues and glaring misspelling of the song title "Shrines" on the lyrics sheet shows a lack of attention to lyrics not unheard of in metal, but no less disconcerting, undermining the albums power. The two bonus songs interestingly offer an ideal to surpass an inherently hostile world. "Shrines" and "Symbolic Virtue" extoll a fearless acceptance and endurance through and beyond 'abject miseries' 'enduring scars,' highlighting a hidden virtue in the fearless. The themes discussed are by no means disingenuous though. They reveal an almost pagan destruction of modernity’s shortcomings. A well executed eulogy to what man was. 7.0 / 10 — Robert F.
Posted April 2, 2018, 10:58 p.m.
Posted Dec. 4, 2014, 7:38 a.m.
Posted Dec. 17, 2013, 2:45 p.m.
Posted Oct. 15, 2013, 6:55 p.m.